← Is the arm stroke in swimming a ‘pull’? How many times have we said (or heard) the words “snap your feet together”? When teaching breaststroke kick it would almost seem a standard ‘bread and butter’ saying. But is it correct? 3. Whip feet around upwards. I believe that the Coach’s demand of: ‘snap your feet together’ is the wrong message to be demanded out of young swimmers. It misses the whip around. If you were to look on You Tube and look up the fastest swimmers in the world you would quickly see that they do not snap their feet together but whip their feet around in a quick sculling motion. Kosuki Kitajima is the best but you will be enlightened watching many world class breaststrokers. Those talented enough to make that upward sculling motion morph into a full lift upwards with feet back to hips, ready for next kick, are the super ‘Breaststrokers’ of this world. Some are able to whip so quickly that they put in a downward dolphin kick as part of the whip around, which is totally illegal, but is actually more common than you might think. Why do we stick to this saying? I believe it is repetition or habit. Something said that was deemed untouchable in its unconditional accepted standard. But is it? I believe we must check the repeated ‘saying’s that may have been true in the past but may have now changed due to a stroke mechanics improvement. This is one of those sayings. If the stroke has evolved into a better stroke then the repetitive ‘shout-outs’ by coaches needs to change too. It is always important to remember that meanings change over time like the Chinese Whispers game so it is important to be vigilant about old tired coaching terms. So we should open up our vocabulary and say what we mean plus be animated! 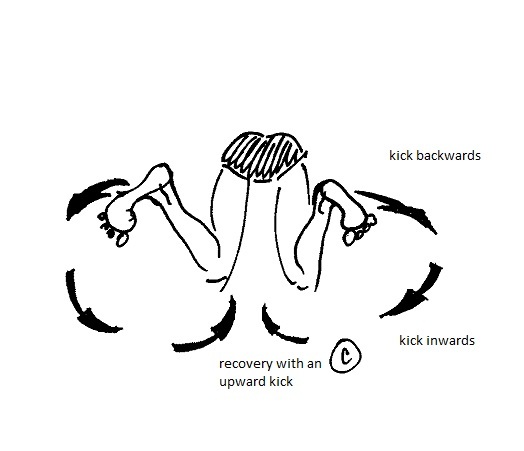 In a breast kick; don’t snap your feet together! WHIP THEM UP. This entry was posted in Breaststroke and tagged Breast kick, breaststroke, Breaststroke kick, improving swimming, principle of specificity, skulling, smooth swimming, swim, swim technique, swim training, swimmer, swimming, swimming kick, swimming technique, training, tricks of swimming trade, wave. Bookmark the permalink. 2 Responses to “Snap your feet together”! Interesting thoughts. While I was never world class, terms “snap” and “drive” were common comments in poor races. I used the same words when I became a coach at first, instead I focused on body position and alignment. Using those terms to redefine how I thought about BR allowed me to use better cue words for younger swimmers. Andrew, thanks for the comment. I really am looking at how young swimmers interpret the words we use in our daily barrage of demands, and using better cue words is definitely the key.